Home » Posts Tagged "Elections Standards"
The Senate has decided to debate and vote on SB 469 tomorrow. It is the second bill on their debate calendar. This bill by anti-teacher zealots Jeff Melcher and Julia Lynn has been crafted specifically to end teacher representation in Kansas. It is intended to ensure that no teachers in Kansas will have representation in collective bargaining. The bill requires every teachers’ association to stand for re-election every three years even if no other organization submits a challenge to representation rights. Even if unopposed, the ballot must include “no representative” as an option. It then holds the organization to a requirement to get 50% + 1 of all eligible voters. Not 50% of votes cast but 50% of eligible voters even if some teachers chose not to vote. If held to the same election standard, not one of the members of the committee that crafted this bill would be in the Senate today – even the two that were unopposed. Senator Melcher asserts that it is a pity that teachers don’t get an annual vote because new teachers must wait until an election to weigh in on representation. However, he has no concern about new voters who have to wait until he stands for re-election to vote for the candidate they want. In the hearing, Julia Lynn announced the bill would be passed before opponents were even allowed to testify. It was clear that the committee was not interested in the thoughts of the education community. 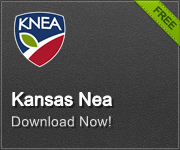 Opposing the bill in committee were KNEA, the Kansas Association of School Boards, the Kansas School Superintendents Association, United School Administrators of Kansas, and other Kansas unions and individuals. Support came only from the usual anti-education organizations; the Kansas Policy Institute, Americans for Prosperity, and the anti-collective bargaining American Association of Educators (AAE is funded by right wing think tanks and foundations). 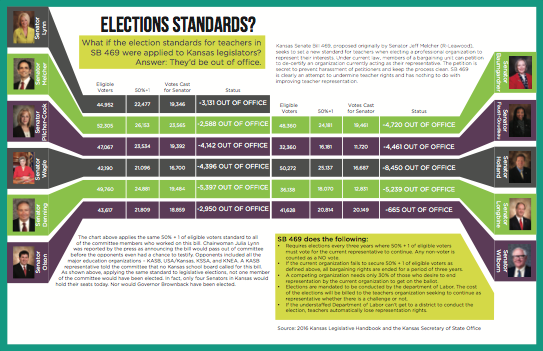 What would the Senate look like if they applied the same election standards in SB 469 to themselves? Click Here or Below and share. Click the image to view a graphic showing what the effects of SB 469 would look like if applied to Senate Committee members.